On the 5th of May a small team of us (mostly non-runners) will be taking part in the Bristol 10k again to raise money for the Breast Cancer Unit Support Trust at Southmead Hospital in Bristol. 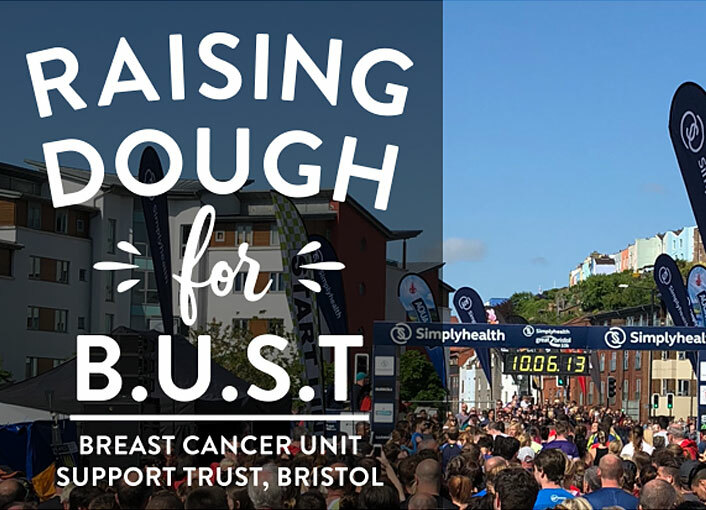 We’ve chosen BUST for the second year in a row because several people connected to the bakery and family have been effected by breast cancer and received fantastic treatment at Southmead hospital. Raising funds for BUST enables them to buy advanced equipment before it is available through NHS funding. Many of us are new to running, in fact because baking involves a lot of hard work and long hours, exercise is not high on the list once the day is done. But we’re all in training, finding the time to brave the weather and clock up the miles. We’ve now set up a Just Giving page (here) – please donate what you can and keep an eye out for us on the day in our ‘Raising Dough for BUST’ T-shirts!